Instead, she was confused and disappointed. 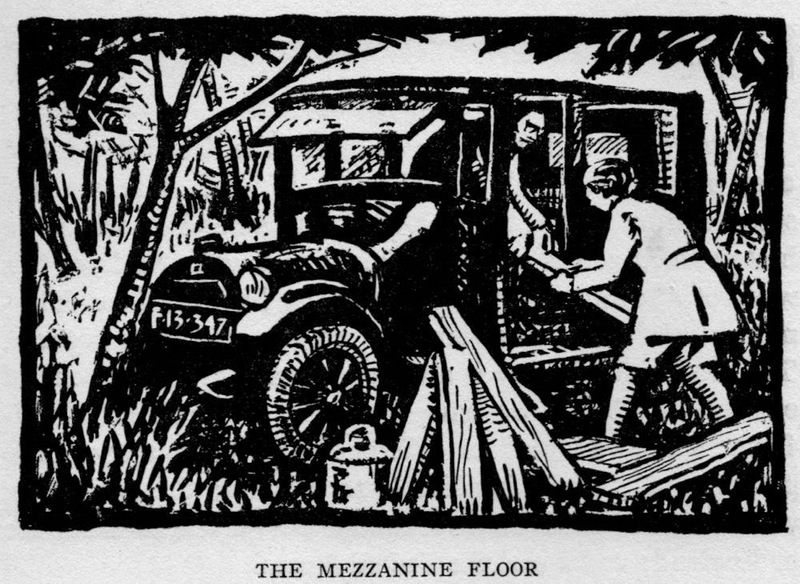 "And at last, when I came to Matisse, and passed from him to Vlaminck and to Van Dongen, and came at last to Henri Rousseau, before whose pictures the committee of the Indépendants itself had dug holes which had been filled with muddy water to discourage the hooting crowds, I feel that I have no proper means to express my puzzled dismay." The character Lucie Pirelli surprised Cora when she announced that she would be exhibiting at the Autumn Salon, "it's the only really serious show in Paris." "And Matisse has opened a school. ""I'm going to study with him." The Académie Matisse, a non-commercial school funded by the Steins and others, in which Matisse instructed young artists, operated from January 1908 until 1911. "I remembered that with Scar, Lucie had defended this man Matisse whom everybody else that I knew accused of being a charlatan. 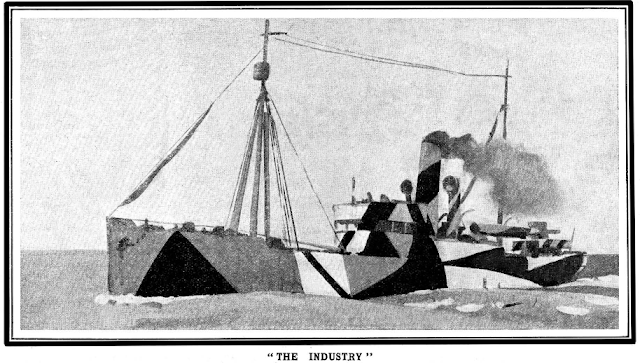 'Matisse,' they said, 'why he couldn't make a living at straight painting and so he took to inventing stunts to shock. He has even admitted as much.' I left Lucie's in an almost awed mood. Of course I had heard and read about genius; had imagined it as something transcendental, cared for, clean .... Above all, clean. I had never before thought that a person could live just for Art - live only for Art - neglect everything for Art. The idea troubled me. It was a question aimed at myself." "Though Cezanne had died in 1906, Van Gogh in 1890, Seurat in 1891, and Gauguin in 1903, though the Indépendants had been in existence from 1884 and had really in full blast since 1905, the definite war between the academic painters and the Fauves had as yet hardly caused an echo in the schools of Paris, Monsieur Gruke's class excepted. Indeed, the academic painters had not yet apprehended any danger; they still looked on the younger school with a pitying disdain and a half-exasperated puzzlement. The opening of the Matisse Academy conveyed no warning note. 'He'll catch a lot of lunatic Russians, but nobody serious,' they said." Four years later, Cora Gordon was noted as a follower of Matisse in a review of the 1912 show at the Baillie Gallery: "It is clear that this lady has received her training in Paris, and that she has imbibed the principles of the later Post-impressionists. In several of her water colours, and especially in the Fan design (No. 26), she proclaims herself a follower of Henri-Matisse. Her synthesis of the human figure in the act of dancing might be directly derived from that artist's decorative panel at the Grafton Galleries." 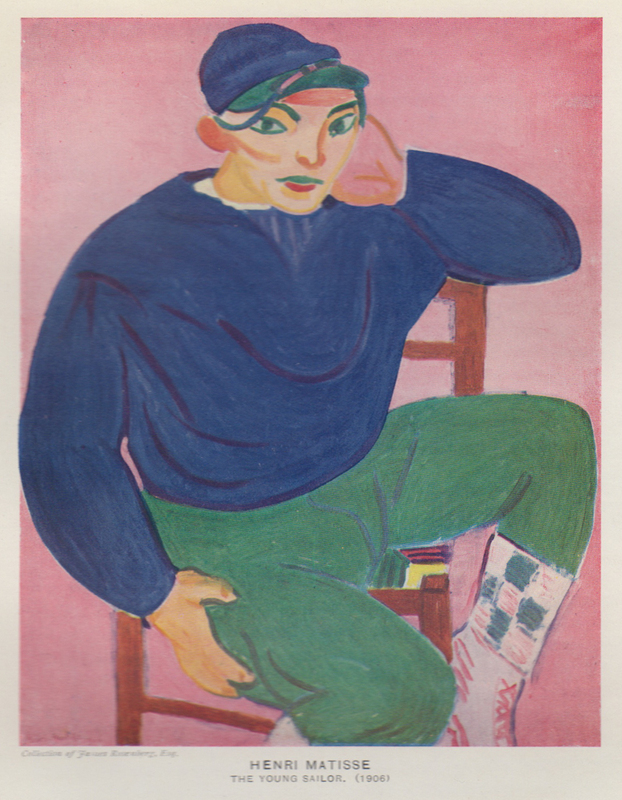 Matisse's "The Young Sailor" (1906), reproduced in Jan Gordon's "Modern French Painters" 1923. Jan Gordon later (1923) wrote about Matisse in his "Modern French Painters." "Matisse, in reality, shocked his audience not because he knows too little, but because he knows too much; not because he cannot draw, but because he has learned exactly how much drawing is worth. He was almost too logical. His earlier pictures seem not so much the direct result of sensation, of an emotion remembered in tranquillity, as of an emotion reconstructed in moments of logical activity." He reproduced Matisse's "The Young Sailor" (1906), shown above. Gordon used "A Girl in the Art Class" not just as a biography of Cora Gordon, but also as a vehicle for painting the picture of that period of transition from naturalism to modernism in Art. It provides a fascinating insight into that time of profoundly changing values.